Inscriptions: u.r. handwritten in pencil: "gets too dark up here"; u.l. 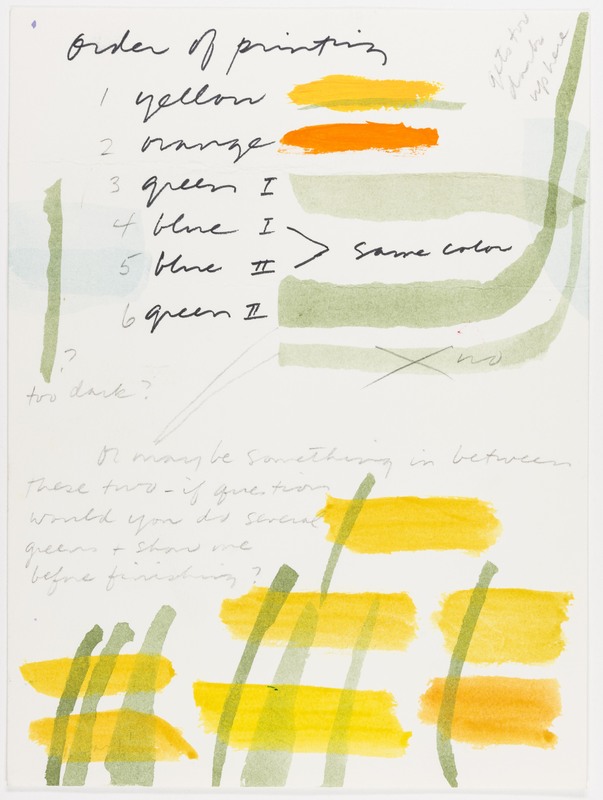 handwritten in ink: "order of printing / 1 yellow / 2 orange / 3 green I / 4 blue I / 5 blue II / 6 blue II"; u.r. handwritten in ink: "same color"; c.l. handwritten in pencil: "? too dark? "; c.r. handwritten in pencil: "no"; l.l. handwritten in pencil; "or may be something in between these two - if question would you do several greens + show me before finishing?" "Untitled." Corita Kent in the Grunwald Center Collection. Los Angeles: Hammer Museum, 2017. https://​hammer.ucla.edu/​collections/​grunwald-center-collection/​corita-kent/​art/​untitled-layout-for-come-up-a/​.